Sometimes, having ice cream can be better than having a date on Valentine's Day. Whether it’s because of sad circumstances or by choice, sometimes one spends Valentine’s Day alone. But even though one may not have human companionship for the day of love, the happy fact remains that it can always be spent with something a little sweeter: ice cream. Sure, the article does say “Valentine’s Day Gift,” which assumes the transfer of goods from one party to another — yet treating oneself on the day of love is perhaps just as important and surely counts just as much as a gift. The community at Marquette agreed with this, sharing favorite flavors and comments about the great things ice cream can do on Valentine’s Day (or perhaps any day, for that matter). Anna Otto, a recent graduate of the College of Communication, said that her ice cream flavor of choice would be mint chocolate chip. “It’s the best flavor out there, and it’s sweeter than the affection of any man,” Otto said. Yet Sam Lee, a sophomore in the College of Communication, said it was a different taste he would turn to when looking to soothe his soul. Both Lee and Otto had clear opinions on which flavors are best, with Otto’s further statement’s revealing that there is indeed some division among the ice cream loving community when it comes to the most delicious (and therapeutic) flavors. Practically speaking, cookie dough is most often less expensive than mint chocolate chip, or at least at Sendik’s Fresh 2 Go on campus. The former typically runs at $4.99, and the latter costs $5.29. However, luckily for mint chocolate lovers as well as anyone simply hoping to buy ice cream in bulk this Valentine’s Day, there is currently a 5-for-$5 deal going on for mint chocolate chip. Looking for quantity over quality at all costs, it would seem the classic green flavor is a good way to go this February 14. 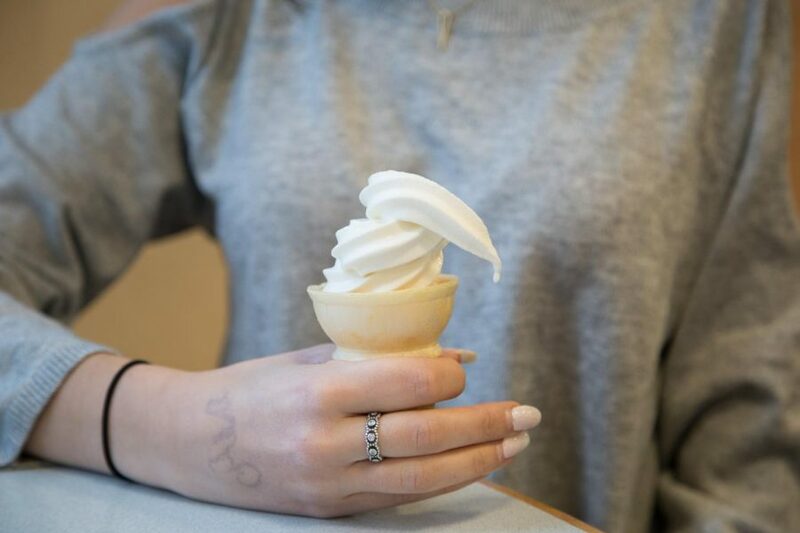 When it came to ice cream recommendations, however, Lauren Dod, a sophomore in the College of Business Administration, was very specific with both what flavor to eat and where to get it. Vowing to take no other substitutions, she specifically praised the Salted Vanilla ice cream from Purple Door in Historic Walker’s Point. “If it’s not from Purple Door, I will throw it out of the window,” Dod said. Another option Dod offered was Purple Door’s whiskey-flavored ice cream. “It’s like drinking, but it’s not as sad because there’s not actually any alcohol in it,” Dod said. Eating ice cream alone is in fact much safer than drinking alone on Valentine’s Day, as the side effects are much less dangerous; a full stomach and smile on your face are much healthier than a wicked hangover and liver damage. Though ice cream is typically thought of as a summery treat, it doesn’t have to be reserved for between May 21 and September 21. The delicious dairy treat can be eaten any time of the year, but if one happens to be spending Valentine’s Day alone, they may find it to be the day on which ice cream tastes the sweetest.